1- Website registration button and form both are USELESS - many people will submit and will think they've registered. For mobile users, register button @ website footer is not clickable because it is too small down the screen so you need extra step to zoom-in. Recommendation: Eventtus link or widget should replace the registration form (that even has too much fields such as LinkedIn, etc). Collecting emails and database should not be an objective. Objective should be ticket sales - simple! 6- The 9th of September post that has call to action is redirecting to home page of Eventtus while banner resolution itself is very low (due to too much details and info). 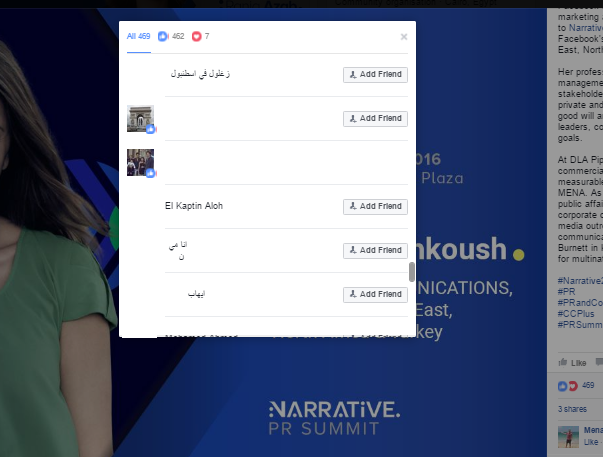 7- Facebook advertising campaign needs some tweaks in targeting settings as I see many Arabic accounts liking their posts which are irrelevant segments (see the image above).